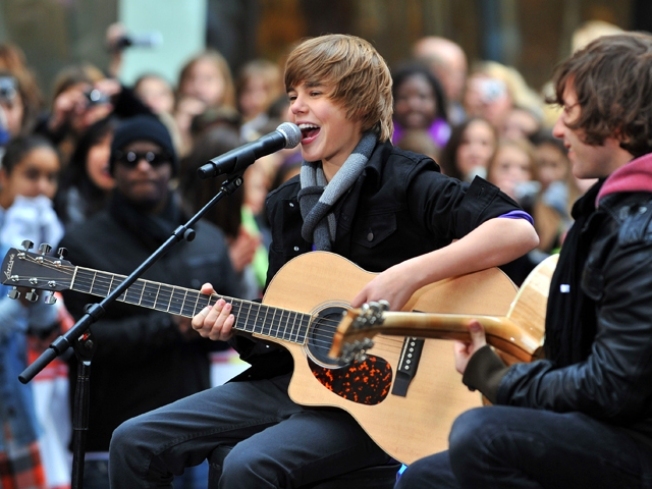 Justin Bieber performs on NBC's "Today" at Rockefeller Center on October 12, 2009 in New York City. A record executive is facing the music after a planned CD signing got a little crazy. A one time appearance from 15-year-old Canadian singing sensation Justin Bieber landed a music executive in jail after a teenage melee broke out at the Roosevelt Field Mall on Long Island. "It definitely wasn't safe," Kirsi Moseman, who witnessed the entire event, told NBC New York. At least one girl was taken out on a stretcher as about 3,000 fans crowded outside of the "Justice" store on the second tier inside the massive Long Island shopping center at about 3 p.m., according to Nassau County cops. Cellphone cameras were rolling while thousands of fans -- many more than expected, and mostly teenage girls -- tried to get into a clothing store to get their CD signed by the teen heart throb. "They were trying to get everybody out of [the store] because the window glass was shaking ... the whole crowd like pushed back," Moseman said. "That was kinda scary but our parents got us out of there." There was a lot of pushing and shoving officers had to be called in but the Nassau County Police department reports James Roppo with Island Def Jam Records continued promoting the event. After it became clear that the event was turning into a hazard, Bieber tweeted: "They are not allowing me to come into the mall. if you dont leave I and my fans will be arrested as the police just told us." And a few moments later he posted: "the event at roosevelt mall is cancelled. please go home. the police have already arrested one person from my camp. I dont want anyone hurt."